About a week ago, Big League Stew posted a video a Cincinnati Reds fan had made of his Chris Sabo bobblehead doll rotating on a platform to Mannheim Steamroller. My first thought? That’s pretty lame and I can do way better — the bobblehead isn’t even bobbling its head! Plus, I bet I can do more than one doll at a time. I mentioned this to Dave, and while he’s not a big baseball fan, throw in the opportunity for some engineering design and he gets into it. After taking some measurements and doing a little white board diagramming, we took a trip to Home Depot to buy equipment to build the bobble platform with a fixed mount for the camera. The hats are actually modified socks from the Target dollar bin, the “snow” is cotton balls, and the song is mine. It’s way better than the Cincinnati Reds video… it even features a cameo by a wind-up Jim Thome. 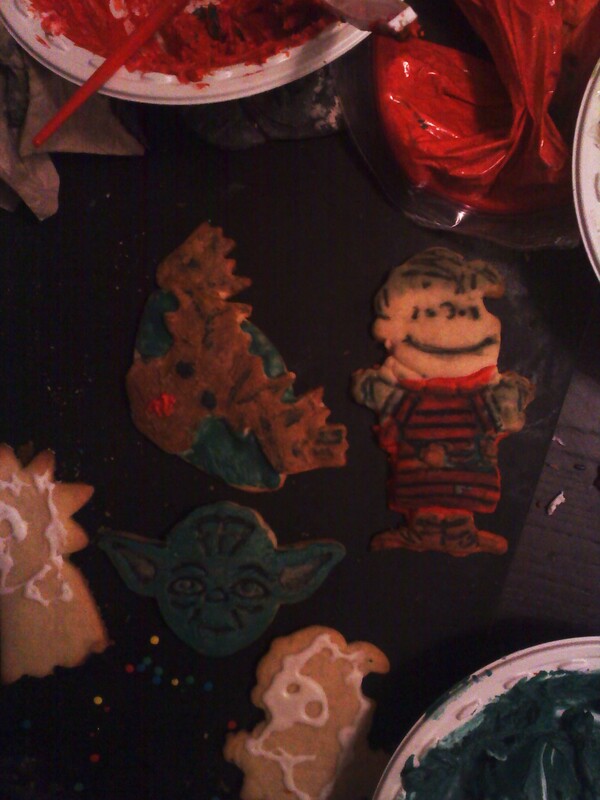 Here are the highlights from the cookie decorating party I went to yesterday. Linus is my favorite — he’s three different colors of dough and some carefully placed black icing. Delta, in their infinite wisdom as an airline I am frequently stuck flying, has not figured out how to manage planes the day before Thanksgiving. And thus, my 12:40 AM red eye flight to Minneapolis is now a 2:10 AM flight to Minneapolis. But they were kind enough to give us “refreshments.” (I snagged a can of orange juice because caffeine before a red eye seems like a terrible idea.) At least SFO has free WiFi. In other news, thedan informed me of a puzzle competition that Google was hosting on Twitter and now it seems I have a Twitter account. I made an attempt to find people I know, but I probably missed some. If you’re a tweeter and I should be following you, let me know. I have yet to decide if I will ever tweet anything again, but the colossus_rhode account (the “of” was taken) is now there if I want to. (I do promise never to tweet my bodily functions.) But don’t worry… the world isn’t ending. I’m still not on Facebook. Happy Turkey Day, everyone. May your Thanksgiving have a better start then mine. This weather thing has already screwed me up a few times. I nearly forgot to plan my trip home for the fair and other Minnesota summer things because it never stopped feeling like spring in San Francisco. Baseball season is ending in a week, and I am not prepared because I see no leaves turning colors. My roommate reminded me about Halloween and I realized that I haven’t even thought about it once… partly because we were talking about it while swimming in an outdoor pool. Last weekend, I caught the intro to the local news and the weather promo was “Later we’ll tell you about how the temperature might change by as much as five to ten degrees next week.” And that was said without irony. Harvey once told me that he didn’t understand why people from Minnesota complained about the lack of weather. His metaphor was something akin to why a person would ever want to eat a glass sandwich when they could eat steak all the time. Well, Harvey, if all you ever eat is steak, it gets boring. I need my seasons to remind me that life isn’t permanently on pause. Our neighbor upstairs is, for inexplicable reasons, blasting his music with the bass seemingly turned all the way so that we can hear it. And what is he blasting, you ask? The “Christmas Shoes” song! If you, like my roommate, are not familiar with this fantastically cheesy song, I will share it with you as I shared it with her… it’s so bad it’s good. If you’re intrigued by the story of the shoes, it was made into a made-for-TV movie starring Rob Lowe, and apparently it will be on Lifetime tomorrow. Yes, they drag the schmaltzy plot into a two hour movie. Time to set the DVR! The subject is, of course, referring to the weather. It always makes me nervous when it doesn’t snow until after my birthday, because then I’m never sure when I should decorate the tree. This year, having been busy for most of the week, I kept putting it off. I finally had a free day today, and probably would have decorated it anyway, but it’s so much more appropriate to do so when it’s snowing out. Also, I had to drive all the way to Sudbury this afternoon to find a Christmas present for my sister. (This was after checking a number of stores in Porter/Davis and then Beacon Hill and Newbury Street and Downtown Crossing and the Galleria and coming up empty handed.) While I don’t think she ever looks here, she might, so I’ll refrain from saying too much more. Except that she better like it. And now, I have to make a blueberry pie to bring out to Sarah B’s in Needham.